Low resistance, lightweight ADDvox™ Humidi-Foam™ Stoma Filters offer excellent protection against dust, dirt and pollen, while helping warm and moisten the air you breathe. Designed for single use, with a hypoallergenic, non-irritating, self-adhesive strip that's comfortable and easy to apply. With microporous adhesive (skin tone only). Not recommended for cannula users. Skin tone (also available in White, see Stock Number TR1115 WH below). 2-1/4" wide x 2-1/2" high x 1/8" thick. Day or night, you'll breathe easier! Package of 60 filters, plus a FREE dust proof and waterproof Filter Storage Pouch for your pocket or purse! 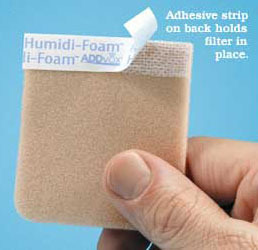 60 Humidi-Foam™ Skin Tone or White Stoma Filters/pkg: 1 package $36.00, only 60¢per filter. Buy 5 Packages or more and save! $35.00 each package - only 58¢ per filter. Shipping is only $7.50 for Prority mail or $50.00 for UPS Second Day Air within the Continental US including Alaska and Hawaii.